Intention is to follow a battle between ancient Spanish under Sertorius and late republic Roman under a young Pompey @ 650 pts or so on a 6' x 4' table. First the orders of march. Comments more than welcome! 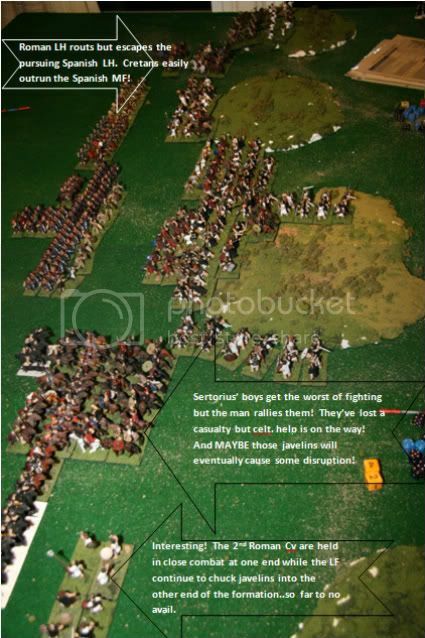 The order of march is such that the main punch (two BG of MF fronted by two BG of slings and supported by a BG of 6 drilled MF) is placed last, so that it can more likely have a chance of lining up favourably against the Roman heavies. Celtiberian 6 pak is for cavalry support on one flank. Even Pompey rates as TC for a bit of flavour . Light Horse to delay on one flank and armoured, superior cavalry in two 4-paks to deliver a hard blow on the opposite flank. For that reason, deployed last in the march order to allow for best choices. Not a lot of heavies, I know, but it is only 650 pts. Cretans being superior can absorb a bit of damage. Javelinmen to go in front of the legionaries so that enemy skirmishers can't draw out the shock foot in unwanted charges. The Terrain. Spanish won the initiative which meant Sertorius succeeded in catching Pompey in the hills. Spanish chose a large rough as mandatory, leaving the Roman with a steep hill . Spanish then chose 3 hills, 2 covered in brush and 1 with plantations, as well as an area of broken. Roman chose nothing else since there were no open areas to be seen! Both mandatory pieces dropped on the Spanish side along with two of the hills. The idea of choosing the hills and covering them with brush was in part to deny the Roman player trying to place gentle, uncovered hills. 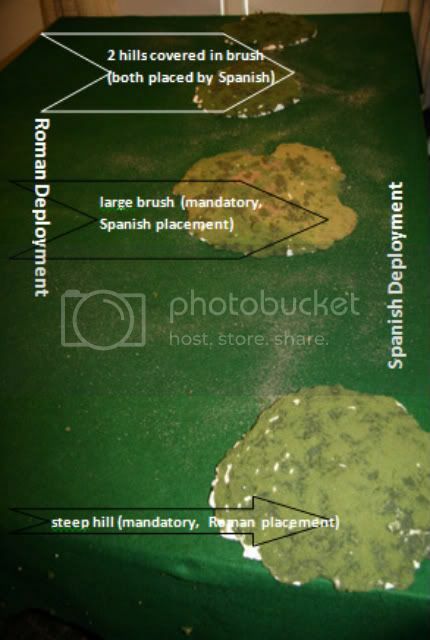 An interesting terrain layout, but it probably means the Spanish will have to drive down off those hills to get at the Romans. Maybe a flank will be successful before the legionaries need to be hit! Last edited by Blathergut on Mon May 19, 2008 5:54 pm, edited 3 times in total. in the ancient spanish list they are shown as average ...would be nice tho!!!! But they won't count as moral support for CT's if average, only physical by being there. philqw78 wrote: But they won't count as moral support for CT's if average, only physical by being there. Celtiberian 6 pak is for cavalry support on one flank. Roman dogs deploy first, having lost initiative. The legionaries march onto the field. Let the Spanish scum know where they are; we'll slaughter anything that comes at us! They've actually lined up opposite the brush since it will be slightly better fighting in that than on brush-covered hills. In the distance the Romans can just make out the Spanish supply camp. Roman camp is just right of the legionaries. First Spanish to reach the battlefield are Light Horse and Light Foot. LH and LF deploy on the Spanish right flank, just at the rear edge of the hills. If the going gets bad, the hills will be a good defensive point. One other BG of LF is deployed on the far left flank of the Spanish, just in front of the steep hill. The Roman LH deploys on the Roman left flank (still in the shade of the early morning ). It sure won't want to go up into those hills, but hopefully can delay for as long as necessary. The plan is to support it with some Cretans just to their right. 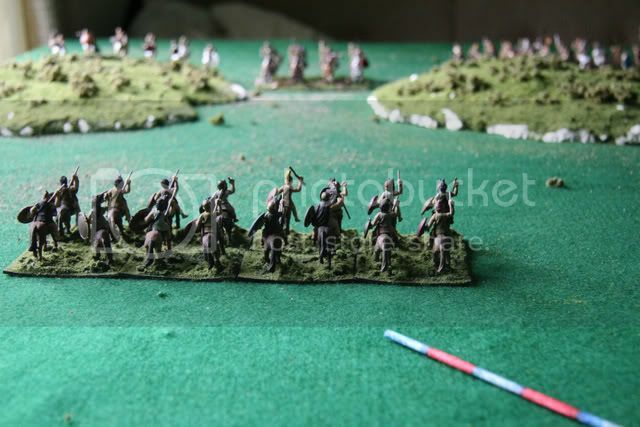 As well, the javelinmen deployed in front of the legionaries. 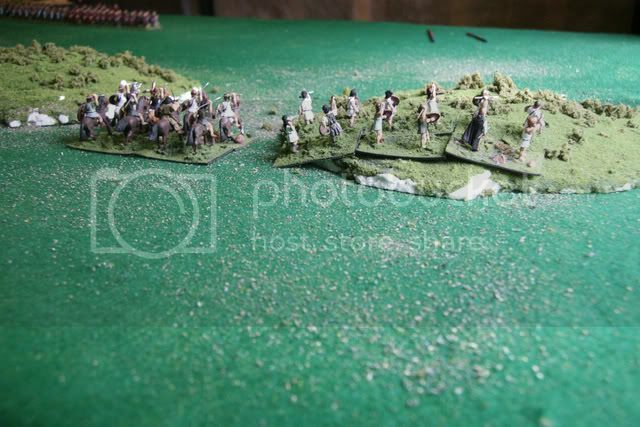 From the Roman centre, Spanish heavy cavalry appears on the Spanish left flank along with some heavily-packed foot...our bets, Celtiberian riff-raff! 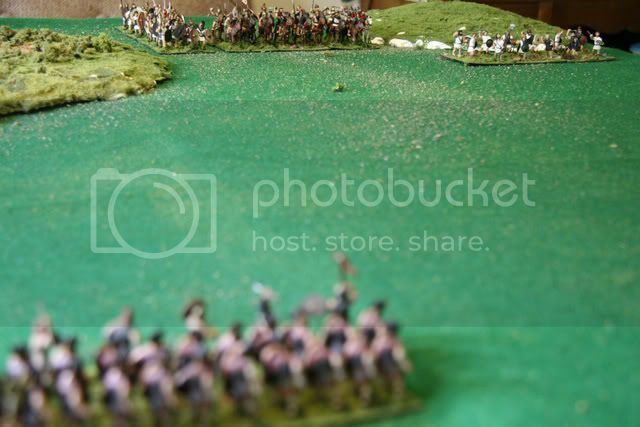 Again from the Roman centre, they see more infantry forming up behind the hills. Slightly less heavily-packed...ye olde standard MF n'est-ce pas? 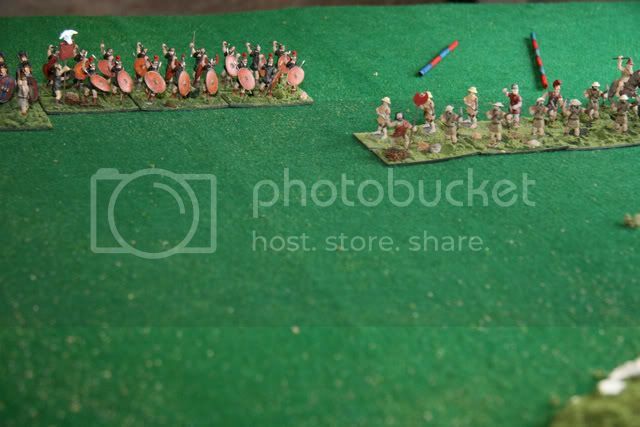 A battlegroup of offensive spears and a battlegroup of very drilled-looking archers take their positions in the Roman lines. The slingers take up positions in the brush. (Don't look tooooo closely at them...they seem to look an awful lot like old Roman velites! Eventually the slingers will get painted.) One BG of MF form up behind the slings. The Gallic heavy cavalry form up on the Roman right flank, though they look a tad outnumbered when gazing across to the other side! Pompey joins one BG and Memmius the other. 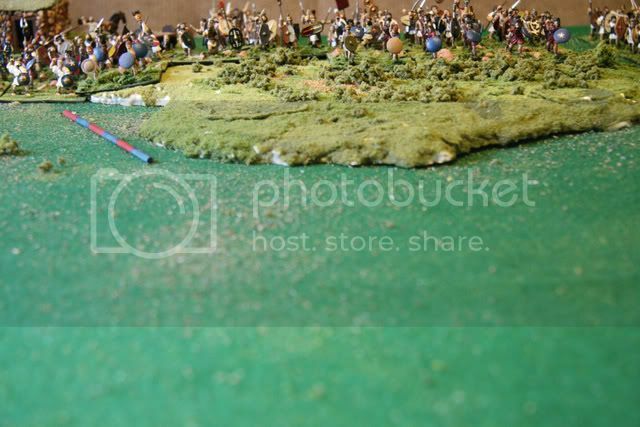 Romans win this flank or else there'll be no Pompey the Great!!! Last Roman TC joins the legionaries. From the Roman lines that area of brush sure does fill up with Spanish mobs! Now, if the legionaries can just get into them before anything disastrous happens on the flanks! 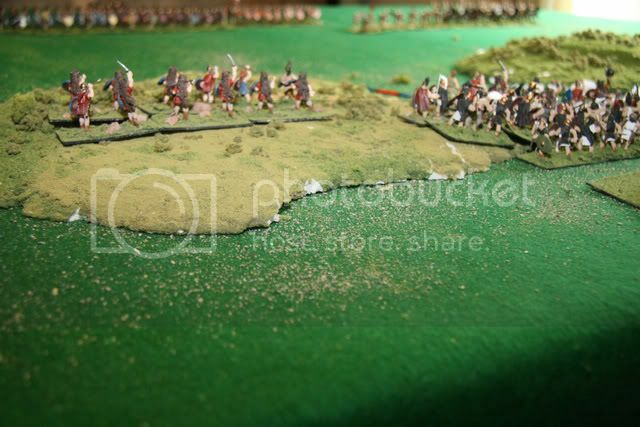 Eagle-eyes Romans spot that renegade Sertorius with his heavy cavalry. No doubt his other once-upon-a-time Roman commanders are with those BGs in the rough. Last edited by Blathergut on Mon May 19, 2008 7:51 pm, edited 3 times in total. ahhh...see?...brain IS going! !...meant that they are a bit better being HF in the open facing cavalry so they can assist that BG of Spanish horse...poor choice of words!!! Was looking at the title of the thread and maybe I'm just set in my ways but why does B.C. have to be renamed B.C.E.? Political correctness? Anyway, nice report. I always like the reports with the pictures. flameberge wrote: Was looking at the title of the thread and maybe I'm just set in my ways but why does B.C. have to be renamed B.C.E.? Political correctness? Nothing much really happens except the lines begin to close. One thing I really enjoy about the rules and the 6' x 4' table in 25mm is how quickly the lines do connect. No more element here and element there diddling around. A bit of movement on flanks but even there, your flank troops basically connect with opposing flank troops. Sertorius and the boys do seem to have stuck their proverbial necks out a bit...with only LF on their left to annoy the second Roman cavalry BG. 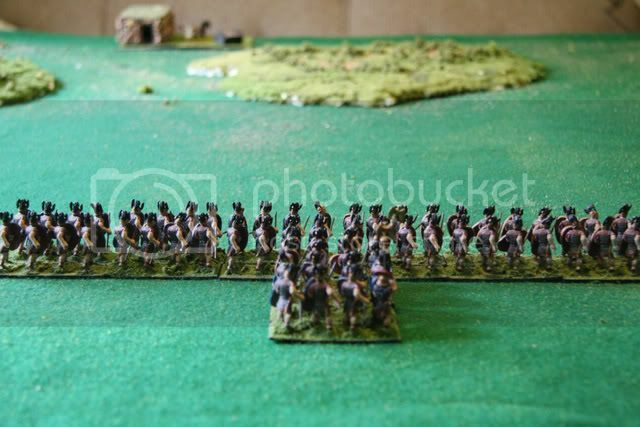 How would you generals out there have handled first turn moves? Pity about the B.C.E but nice pics with very good explanations superimposed. I particularly like the last picture. 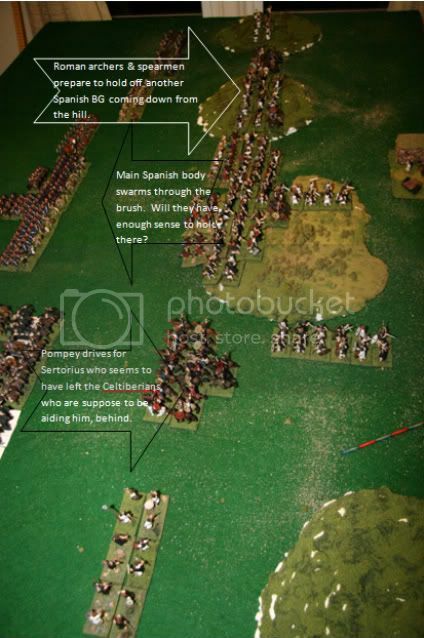 This is of particular interest to me because I am halfway through painting a 1/72 Spanish Army. Well...actually, end of turn 6 but I like to think of two player turns = 1 game turn. The centres still hold back, each waiting for favourable results on one flank or the other. The Roman left flank seems to be hurting, with one BG of LH routing and the Cretans evading, but on the far left of their flank, the other LH is getting the better of the Spanish LF on the hill. 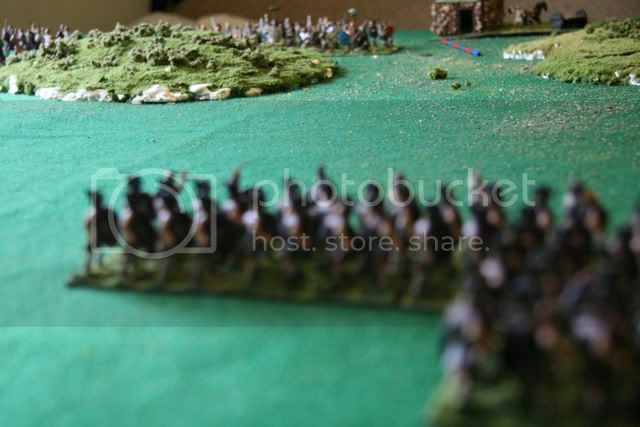 One more round of combat may see the Spaniards rout. With Sertorius and Pompey, the battle rages. So far only results have been Spanish Cv down one notch in cohesion but a turn later they were bolstered by Sertorius. Spanish have lost one casualty but it's not hurting the 6-pak yet. Celtiberians look like they may finally move up into overlap next movement! The 6-pak was definitely nice, able to entangle both Roman Cv 4-paks. 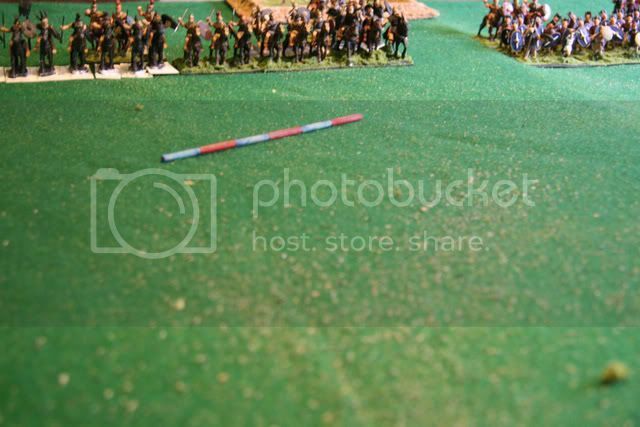 And those Roman 4-paks are vulnerable to javelins! (Spanish hope!) Also, the 2nd Roman Cv can't contract or they open up the flank for the Spanish LF to move past.